The popular towns of Aviemore and Braemar are linked by an exceptionally fine mountain track, and a journey on foot between the two centres makes for an exhilarating 28-mile adventure. The route which connects the two towns is, of course, the Lairig Ghru. The Lairig is probably the most celebrated high level trail in all Scotland and for good reason. It cuts right through the heart of the Cairngorms, the huge mountain plateaux where four of Scotland's 4000-foot peaks are to be found. 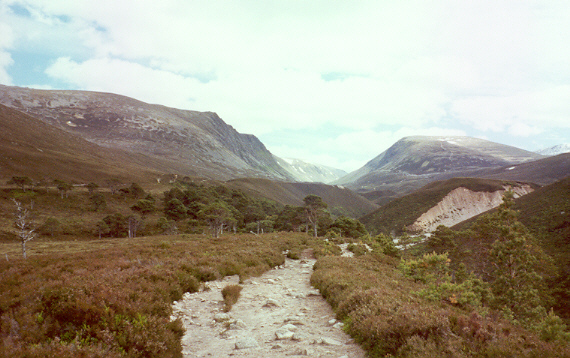 Like its neighbour to the east - The Lairig an Laoigh (which means the Pass of the Calves) - the Lairig Ghru is an old drovers road which is now the domain of the long-distance trekker. The Lairig Ghru is just as easily tackled in both directions but a north to south traverse gets all the climbing done early on and leaves opportunities for an overnight stop at Corrour bothy or Derry Lodge. 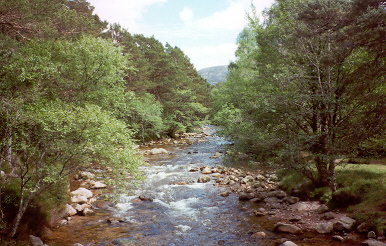 The path actually begins at Coylumbridge, two miles from Aviemore on the B970 at the Rothiemurchus Caravan Park. Enter the campsite and keep right to pass through a wooden gate onto a Land Rover track. After about 800 metres go left at a signposted junction, pass an old cottage, and enjoy the sandy path as it winds its way through the exceptionally beautiful Rothiemurchus Forest. The gnarled and twisted Scots pines, grasses and sedge make you wonder how Scotland would look if more of the old forests had been retained. It certainly makes a refreshing change from walking through a uniform fire-break in a commercial forest. Butterfly hunters were chasing their quarry as I entered a clearing before the path curved back to trace the bank of the Am Beanaidh. Continue on the path, pass through a high fence at a kissing gate and you soon arrive at the Cairngorm Club Footbridge which (according to a plaque which also gives distances and approximate times to various destinations along the route) was erected in 1912. Once across continue on the path which crosses another clearing and dips down to the water's edge before you are finally forced to gain some height as another junction (known locally as Piccadilly) approaches. This time go right (continuing left takes you to Rothiemurchus Lodge). The way gets steeper here as you climb through the trees and along a small crest before the jaws of the pass, framed neatly between Creag an leth-choin and Sron na Lairige, appear ahead. The path becomes more rocky now as it continues its relentless climb into the valley ahead. As you enter the great defile, you cannot escape the feeling of being hemmed in by the towering scree strewn slopes. The path continues climbing and eventually tops out at the Pools of Dee, some 835 metres above sea level. 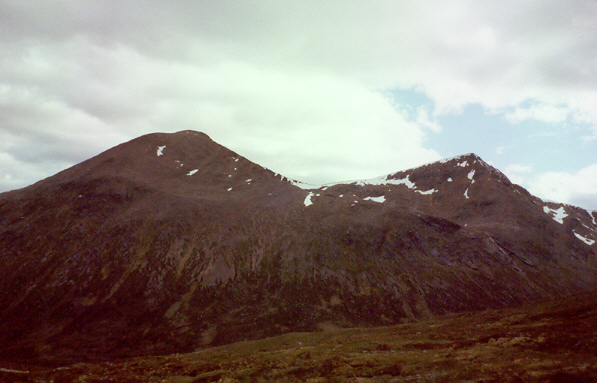 Despite being 2,700 feet up, you are still dwarfed by Braeriach and Ben Macdui on either side! I carefully crossed four small snowfields (despite it being the middle of June) as I started the long descent to Corrour bothy. 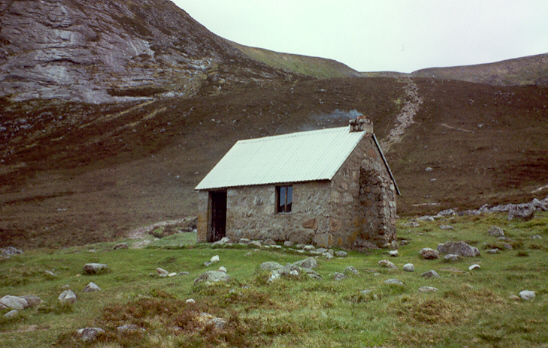 The prominent face of The Devil's Point is unmistakable up ahead and I knew that the tiny bothy lay at its feet. The path continues to descend and passes some large boulders to your left. The biggest of these is the Tailors' Stone (Clach nan Taillear) where legend has it that three drunken tailors perished trying to ride out a violent storm one Hogmanay. To reach the bothy you have to cross a small bridge and double back across some dreadfully muddy ground. A couple of gents were leaving the tiny hooch as I approached. ''Is there anyone at home?'' I enquired. ''No. One detached residence at your disposal!'' came the reply. Detached is certainly apt for this spartan little building. There's no doubt that it has been a veritable life-saver over the years but I shunned its cold concrete floor on this occasion as I was making good time and I hadn't carried a tent all this way for nothing! From Corrour you have two options. The lower path exits via Glen Dee but the higher one takes a more scenic route round Carn a Mhaim and through Glen Luibeg. As I intended pitching the tent at Derry Lodge it was the latter option I chose. Once into Glen Luibeg, the track drops steeply as you approach some woods and care must be taken on some stony sections which can become slippery in adverse weather. Also requiring some care is the fording of the Luibeg Burn at the bottom of the slope. Once safely across, the path becomes a wonderful sandy ribbon as you approach the cottage at Luibeg. Cross another small bridge to reach Derry Lodge where there is ample space to pitch your tent beside the burn. Next morning dawned bright and sunny and after a quick breakfast of rice pudding and fruit I was on my way again. 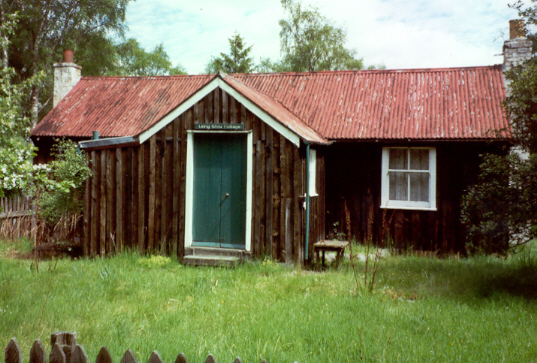 Walk past the old boarded up Derry Lodge and its cluster of outbuildings and up and over a small rise to begin the trek out through Glen Lui. The path is excellent here and would be perfect for mountain biking unlike the heart of the Lairig itself. The track follows the Lui Water and crosses the river at a wooden bridge, taking you into a plantation. Waterfalls can be heard crashing to your left as you follow the path down to Linn of Dee. Don't branch right at the sign for the walkers' car park but keep descending the path which takes you to a barrier gate at the roadside. Another signpost here points back towards the various rights of way in the glen and warns walkers: ''Take care - you are entering demanding and potentially dangerous mountain country''. Go left and follow the road past a new cottage and up and over a small hill, passing some enviable residences on your right to reach the entrance to Mar Lodge. Go down the long drive and marvel at the splendour of the grand Victorian edifice and its tiny adjoining chapel. A couple of benches here provide an ideal opportunity to stop for a bite to eat. Continue walking east past a lodge and then down another tree lined drive to cross the river at the Victoria Bridge. From here the walking is all done on the road unfortunately but there are some fine views out across to the north to be savoured, especially the snow crusted ramparts of A'Chioch on Beinn a Bhuird. Braemar soon appears and as you enter the town you will find a handy little newsagent/pharmacy on your right where you can stock up on camera film and, like me, plasters for those blisters. As I sat outside the Fife Arms Hotel enjoying an excellent pint of Guinness and watching a couple of sparrows deftly picking dead flies from the bumper of a parked car, I hatched a plan to continue the walk into Angus by taking the A93 out of town and carrying on through Glen Callater and up and over Jock's Road into Glen Doll (but that is another story for another day!). Maps OS Landranger sheets 36 and 43. Start/parking Aviemore or Braemar. Aviemore is better served by public transport as it has a rail link. There are campsites, hostels and a range of accommodation in both towns. Grading A strenuous, lengthy hike through demanding terrain with no easy escape routes once you have committed yourself. Be prepared for an overnight stay and take plenty food and water. Full weather protection and safety equipment is also a must. Snow can, and often does, lie here all year round. No real navigational problems in the heart of the Lairig but a map and compass will allow you better appreciation of the surrounding mountains. There are a number of other tracks and paths at either end of the Lairig which do require to be navigated correctly however. NB: A mobile phone connected to the Vodafone network will work from Aviemore to the Pools of Dee on the north side. There is a similar transmitter on top of Morven at the Braemar end but these shouldn't be relied upon and you should always leave details of your walk with someone who can alert the rescue services if something does go wrong.